The large Salmonella outbreak linked to cucumbers imported from Baja, Mexico has prompted some interesting comments on our Facebook page. Many people have said they will not buy imported produce because of this outbreak. But buying locally grown food isn’t a 100% guarantee of protection against foodborne illness. An E. coli outbreak linked to Los Chilangos food truck, which was at farmers markets in Washington state, has sickened at least 10 people. And there have been dozens of recalls for bacterial contamination of food sold at farmers markets. The Centers for Disease Control and Prevention (CDC) has compiled a paper on Salmonella outbreaks in the U.S. from 1968 to 2011. This report divides the Salmonella by serotype (Branderup, Newport, Poona, Saintpaul, Berta), then shows where outbreaks have occurred. The most striking thing about the report, and the maps, is that it shows these outbreaks have happened in every state in the country (except Montana and North Dakota, and those two states are involved in the current cucumber Salmonella outbreak). Food can be contaminated at any point along the chain from seed to plate. For instance, the seeds used to grow bean sprouts can be contaminated on the inside with pathogenic bacteria. Then when the sprouts are grown in a warm, moist environment, the bacteria grow right along with them. Produce can be contaminated in the fields, from feces deposited by wild animals and birds, or from irrigation water contaminated with runoff from large factory farms or from polluted groundwater. Harvest is another step where contamination can occur. If workers aren’t given good hand washing supplies, bacteria can get onto the crop. It is true that the farther food travels, the more chances there are for contamination. Conveyor belts, trucks, and containers can all harbor pathogenic bacteria, especially if they are not frequently cleaned. 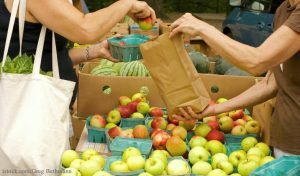 But it’s also true that a local farmer may not know the rules for safe food handling and could inadvertently contaminate foods as they are brought to a farmer’s market or store. And smaller producers are not audited by government inspectors, which can reveal problems. There are definite advantages to buying produce grown locally. The foods will be more nutritious, since vitamin content starts decreasing the moment the crop is harvested. The more distance the food travels, the more its nutritive value will decrease. Buying local is also good for the environment. Less fuel and fewer resources are needed to bring the food to your table. Buying local also supports the local economy. And eating local food in season is the best way to get the most flavor out of foods. Just don’t be lulled into a feeling of complacency because you are buying locally grown produce. Be careful with the food you bring into your kitchen. Look at fruits and vegetables carefully before you buy them. Don’t buy any produce with cuts or bruises. Look for the freshest produce available, with firm and smooth skins. Always wash and scrub produce under running water before you eat it or prepare it. Watch out for cross-contamination with foods eaten raw and uncooked meats, eggs, fish, and poultry. Always wash your hands before preparing food and eating, and wash your hands and utensils well after handling raw beef, chicken, pork, fish, and eggs. Cook foods such as beef and poultry to safe internal temperatures. Check the temperatures using a food thermometer. And clean your refrigerator regularly, especially if it holds unwashed produce and uncooked meats. And if you do get sick with the symptoms of food poisoning, see your doctor. Early treatment of this illness is your best chance for a good outcome. Buying locally does not make anyone automatically safe from disease, it’s true, but it helps. It seems most of the problems caused in this area are done so by people trying to grow enough to sell large quantities. Local farmers may be less inclined to do so and more interested in just selling their crops within 100 or 200 miles of where they grow. It’s easier to get to know your local farmer than it is some corporation in another country, making it easier to judge the characteristics of the people you are getting your food from. One might feel pressure to get a product on the truck faster knowing it’s going to nameless faceless buyers. I’m in North Florida, and if anyone wants to sell food here they are supposed to get a permit, renewable every year. That e-coli incident you mentioned also stated one of those trucks had been inspected 3 times and failed all 3 times. It should not have been selling at all. I agree. I want to make people aware that any produce or food can be contaminated and they should not let their guard down. Don’t get complacent because you buy local. Always wash produce and cook meats to a safe internal temperature.